36100 Five Mile Road (E. of Levan) Livonia. Memorial contributions may be made to the Michigan Humane Society. Age 87 of Livonia. Beloved wife of the late Herman for 45 wonderful years. Loving mother of Robert (the late Grace) LaMondra and Patti (Andy) Vernier. Dear grandmother of Nikki Seeley and Dee (Jon) Sloan. Cherished great-grandmother of Lukey (Luke) and Emmy (Emma) Seeley, Elizabeth (Isobel) and Lemon (Liam) Sloan. Dearest cousin of Mary Lou Wiltse. Shirley leaves behind many loving family members, friends and her grand-pups Poopalolly (Lexi) and Izzy. As the pattern shows, she wasn’t too good with names and would just make them up for people. 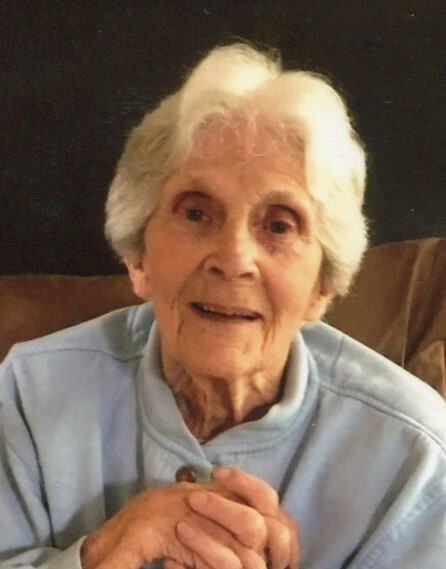 Shirley loved to spend time with her children, grandchildren, and great-grandchildren. She was a wonderful baker, but in her own words would say she wasn’t much of a cook (others would disagree with her on that). She loved to do things for other people. One of her favorite things to do when she was younger was to iron her father’s shirts. When Andy became her son-in-law and she learned that he was paying the dry cleaner to do his shirts, she put a stop to that. She ironed his dress shirts from that point forward. When Shirley was a young girl of 4, her little sister, Patty, died at the age of 2 of lung cancer (she was in the medical books as the youngest person to have the disease). Within two weeks Shirley’s mother passed away, not knowing that Patty had died. Shirley and her father went to live with relatives, and she was raised with three cousins that were in essence her brother and sisters. Stricken with polio at a young age, Shirley didn’t let that bring her down. Even when the post-polio symptoms resurfaced later in life, she took it with a grain of salt. Her one disappoint was that she could no longer wear high-heels, something that she loved to do. Patti remembers walking into the kitchen seeing Shirley at 80 standing on a chair to get something out of the cupboard. Nothing kept her down. She was a whippersnapper! Shirley had been ill for a few months prior to her passing. She had a pacemaker implanted in October, and things never got right from that point until her death. The family knows that Shirley has been reunited with her husband Joe, and is spending long lost time getting reacquainted with her father, her mother and sister Patty, whom she was robbed of at such a young age.